HAS the Whittington hospital been put at risk by the latest reforms proposed for the National Health Service in London? 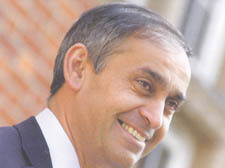 Sir Ara Darzi, a surgeon chosen by the government to shake up the NHS, may not have had the Whittington in his sights, but his glossy 135-page document – published this week – signposts trouble for the hospital. Sources say there was a gloomy atmosphere at a meeting held this week by Whittington doctors to discuss Sir Ara’s plan, known as A Framework for Action. Basically, Sir Ara wants to replace poorly equipped general hospitals with specialist centres and small GP practices with polyclinics. Sitting comfortably are the University College London Hospital and the Royal Free, the former a leading foundation hospital, the latter a candidate striving hard to move up the ladder. Both boast reputations for top-class research. On the other hand, Whittington lies somewhere between an ‘acute’ hospital – admired by Sir Ara – and a lower grade ‘general’ hospital which he wants to replace wherever possible. In contrast to the reaction among the staff at the Whittington, I understand the hierarchy at the Royal Free was gung-ho about Sir Ara’s plan. Hopes were high at a staff meeting addressed this week by chief executive Andrew Way. In criticising the medical services in the capital, Sir Ara points out that 27 per cent of Londoners are unhappy with the NHS, a much higher ­figure than in the provinces, and adds that hospital doctors in London see 24 per cent fewer patients than elsewhere. Critics remain sceptical about these statistics, repeating an old aphorism – used by Winston Churchill – that there are lies, damned lies and ­statistics. NHS watchers will recall a report of the 1990s recommending the closure of the UCLH based on statistics that showed fewer patients would be using it in the future. Following a campaign by the Camden New Journal, supported by Holborn MP Frank ­Dobson, the UCLH was kept open. Sources complain it is not difficult to manipulate statistics. London, of course, is a world centre for research. While it is hardly ­likely the Whittington faces closure, bearing in mind its newly opened £45m wing, mortgaged to a Private Finance Initiative scheme, it is possible its A&E department is under threat. Sources fear that as part of a triangle of hospitals – the Free and the UCLH form the other legs – the Whittington’s A&E is the most vul­nerable. Critics are also worried that large polyclinics would be ripe for a take-over by private companies. “It is not clear how Sir Ara came to be chosen in the first place,” said a source. LAST week I told you that Camden Council was looking for a new leisure and culture chief, the post with a salary hovering around £145,000. Well, they have found one. There has been no official announcement yet, but I can reveal that Rachel Stopard has been handed the job. It’s not just parks and swimming pools and banning barbecues that she will have to worry about – her brief also includes the planning department. So it will be Ms Stopard who will be making sure that the redevelopment of King’s Cross goes like clockwork over the coming years. I’ve heard mutterings that she is more of a communications and PR whiz than somebody with a massive background in planning – but let’s give the lady a chance. Why should we start harping on about her past and a noisy rift with a senior colleague at East Hertfordshire Council a few years back before she has even started in Camden? Ms Stopard’s current job at Essex Council was deleted in a restructuring (there are a few peeps at Camden who know a thing or two about that word) and she is likely to begin work at the Town Hall in Sept­ember. A COLLEGUE went back to school on Saturday to help friends and relatives celebrate and com- memorate the life of the late, great teacher and artist Joe Kusner. Joe, as you will recall, passed away last month following a car accident – he had been unconscious since the tragedy happened two Christmases ago. And among former colleagues, neighbours, relatives and friends, I spotted a face who is no doubt going to become a whole lot more familiar: Sarah Brown, the Prime Ministers wife. Mrs Brown was one of Joe’s pupils – he taught at the school for 38 years, and she was in his class during the 1970s. Mrs Brown told me she had so far resisted the trappings of her husband’s job, such as chauffeur-driven cars. And although originally not on the bill of readers, she accepted an offer to say a few words, and told an audience of nearly 200 of how Joe had been an inspiration to her. My colleague chose to say a few words about Joe, and read from Thomas Hardy’s poem Afterwards. The poem starts: “When the present has latched its postern behind my tremulous stay, And the May month flaps its glad green leaves like wings, Delicate-filmed as new-spun silk, will the neighbours say, ‘He was a man who used to notice such things?”. He ended by saying Joe was a man who would notice such things: a sentiment I, and anyone who was lucky enough to have met or been taught by the wonderful Joe Kusner, will wholeheartedly agree with. I HEAR that Gavin Millar QC – brother of Fiona Millar, ex-aide to Cherie Booth – won a bold victory for Press freedom on Thursday when the Law Lords ruled in favour of the anti-racist magazine Searchlight in a libel action brought by the BNP. An earlier key ruling by the High Court that the magazine’s report was in the ‘public ­interest’ was upheld by Lords Ward, Sedley and Moore-Bick. Mr Millar, who appeared for Searchlight, said the decision was a big development in the right to report political matters. Gerry Gable, editor of Searchlight, who used to live in Camden, held a 70th birthday bash at Hampstead Town Hall while the case was hanging over him. “He is extremely relieved – he is a serious journalist with a great track record,” Mr Millar told me. Government determined to put kids on the streets? HOW do you keep teenagers – especially those from poor families – on the straight and narrow? Fund a club that provides sports training, canoeing, rock climbing and abseiling? Does that sound like a good idea? It sounds pretty good to me, but I’m not an expert on these matters. The more knowledgeable Lib Dems and Tories, who run the Town Hall, wouldn’t agree. That’s why they recently stopped funding the 30-year-old Jubilee club on the Regent’s Canal which now greets the world with locked doors! Yes, local teenagers – it had a membership of more than 600 – can no longer use its magnificent facilities. While police worry about growing knife-crime and gangs on street corners, our far-sighted politicians clearly know how to handle the problem. Shut down an award-winning club. How myopic can you get? Club chairman Martin Shaw (pictured) faces his creditors on August 2 when the future of the club will be decided.